ATLANTIS TÉLÉVISION AND YVAN BOURGNON, A LONG TERM ENGAGEMENT. 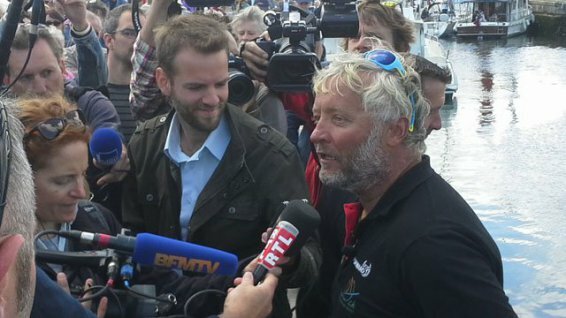 Atlantis supports the marine exploits of Yvan Bourgnon since over 2 years. It’s an obvious sponsoring for the Group, between fundamental values, audacity, bravery, passion and the search of performance. Atlantis and Yvan Bourgnon, one of the most authentic navigators and of the most impressive in the sailing competition, have already shared three great human adventures, technically different one from another, but all rewarding. 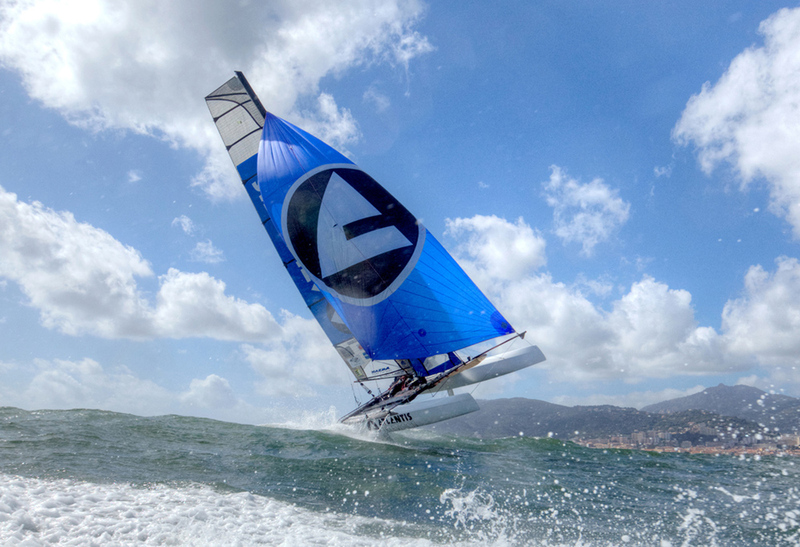 After having tried twice with talent but not enough wind, a first performance in 2013, the Corse tour record, Atlantis and Yvan launched themselves into competition by being on the starting line of every preparatory competitions for the World Championship, in the Nacra F20 Carbon category. On a 50000km course, he sailed only with his sextant, without any shelter to protect himself. After a stop in Darwin, Australia, knowing he only had the Indian Ocean to cross left, to end 80% of his tour, his adventure stopped on August 1st in Sri Lanka, a few hundred meters from the Galle harbor. This shipwreck marked the end of an episode, but not the end of the race. Yvan Bourgnon sailed the Route du Rhum, won the Jacques-Vabre and many other races at sea. It was impossible for him to admit his defeat so close to the end. For the last episode of this fabulous world tour, he says he is really prepared and armed with a prepared boat, lighter and mightier to win the challenge. We will be by his side all along those next 10 000 km of the race, and at the finish, of course, to applause him. Yvan Bourgnon and Joris Cocaud training before the attempt of the around Corsica Island record on the Nacra F20 Carbon “Atlantis Television”, Porticcio, Corsica, France. Ouistreham Riva Bella, En avant toute, June, le Port de Caen, Le Club des Entreprises de Ouistreham Riva-Bella et Foward Sailing are partners to his challenge for the first world tour on a sporting sailing boat unlivable. This unique challenge is taken solely by Yvan Bourgnon offers a 50 000 km course including 27 stops. The course was marked by two great crossings: the Atlantic Ocean, from Canary Islands to Guadeloupe (2 weeks), and the Pacific Ocean, from Galapagos Islands to Marquises Islands (3 weeks). After a shipwreck south of Sri Lanka resulting of a technical problem, Yvan will sail again in March to end this challenge and come back to the Normand coasts during June. In short, this is an adventure never yet realized on such a little boat. Moreover, the sailor wanted to come back to the simple values of sailing, solely with a sextant (without GPS). The food will be lyophilized; a water maker will fabricate the water. June 23rd 2015: the finish line! 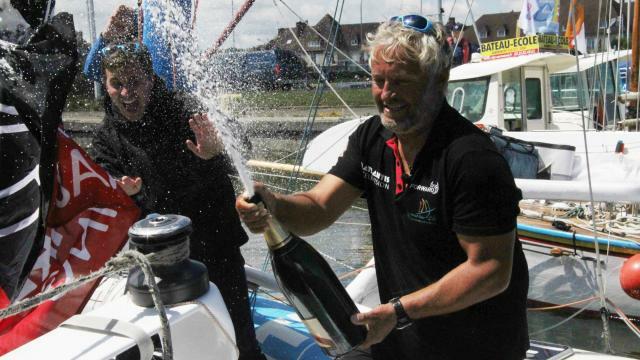 On June 24th, 2015 at 11:30am, Yvan Bourgnon ends his trop in Ouistreham. The sailor, acclaimed by the public who waited on the docks, came back after 20 months of sailing. Surrounded by numerous boats that came to meet him, he does an honorary tour well deserved, for him who went against all odds to achieve his goal. At 1pm, he was entering the harbor, welcomed by Romain Bail, the mayor of Ouistreham Riva-Bella, and then his two kids went aboard his ship to meet him..
Our hero succeeded in finishing an amazing challenge, going through obstacles that could appear insurmountable. it’s with raised arms and a big smile on his slips that Yvan Bourgnon crossed the finish line on Tuesday, June 23rd, a little before 11am, in front of Ouistreham in Calvados. Tired but happy, the skipper and his “Louloutte”, name of his boat, have then gone through the canal and locks of Orne to be welcomed by a crowd, but also by his mother Suzanne and his close ones. I’m happy to be back, anyway I had to put a foot on earth, to see my close ones, and to share this moment with every nature lovers, he said. But I’m so afraid of it being finished that I already planned to leave three weeks on this boat with my kids this summer. But what’s going to miss the most is meditation, silence, privileged moments we don’t have on coast”. A true human and sportive exploit. Gone on October 5th, 2013 from Les Sables d’Olonne, the Swiss sailor of 43 ended a real human and sportive exploit, realizing a tour around the world, on his sailboat of 6,30m long and 4m wide, without cabin. And it’s only with a sextant, some paper maps and a calculator that he traveled on the globe’s seas, a course with some traps, like in August 2014 in Sri Lanka where, when asleep, his boat was wrecked against some rocks. In this mishap, Yvan Brugnon was ejected of this boat but got out miraculously unscathed, which wasn’t the state of “Louloutte” totally destroyed. Back in France a few weeks later, searching for funds to help him get back on tracks, Yvan Bourgnon managed to get back to Sri Lanka and rebuild his boat to start again on March 22nd. After came some other mishaps, like pirates around Djibouti on April, his lack of drinkable water, and his difficulties to cross the red sea. “At the beginning of my course, everybody thought I was crazy, but I’ve always wanted to show to the public that we can realize some human scale challenges without spending incredible amounts of money.” During his course, Yvan Bourgnon will have traveled the equivalent of more than 50 000km. Born in La Chaux de Fonds, in Switzerland, Yvan Bourgnon is the cadet brother of Laurent Bourgnon, who won on “Primagaz” the transatlantic Jacques Vabre in 1997. Experimented sailor, and winner of many records, Yvan Bourgnon had already realized a world tour on a sailboat when he was 8 with his parents, for a 4 years travel. He was the only one to believe in the adventure until the end. 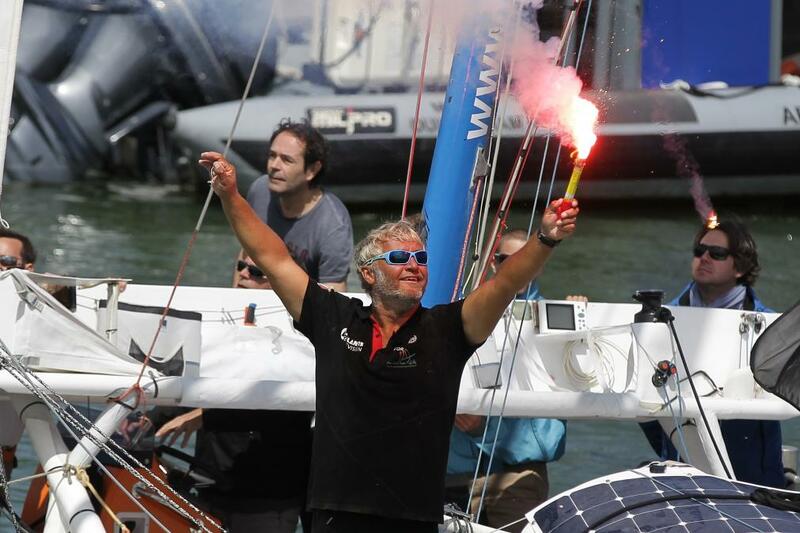 The Swiss sailor, Yvan Bourgnon, 43, ended Tuesday his sailing world tour on a sport catamaran without cabin, sailing old school (without GPS but a sextant and simple maps) and alone. He had left the Sables d’Olonne’s harbor in October 2013 with a friend before this one gave up at the first of the twenty stops planned. Coming from Port-Saïd in Egypt, he crossed the Mediterranean Sea during spring, and then came up the Atlantic from the strait of Gibraltar. 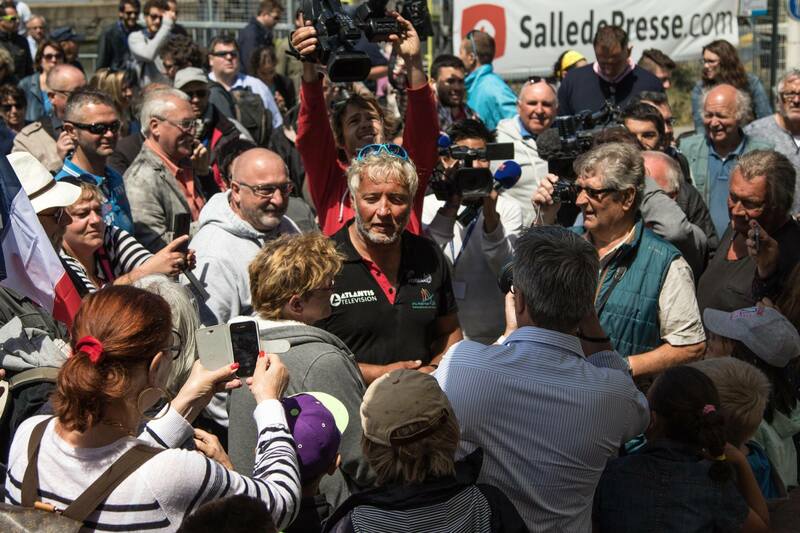 “I’m really happy to be back, see my family and share this moment with every nature lover and the ouistrehameses”. Twenty months after his departure, Yvan Bourgnon arrived on Tuesday in Ouistreham and finished his course of over 55 000 km on the globe’s seas; and all of this on an unlivable sailboat. After three oceans, thirteen seas, twenty stops, seven storms, a wreck and two capsizes, Yvan Bourgnon ended his world tour on Tuesday, at 1pm. Gone from the Sables d’Olonne in October 2013, the Swiss sailor managed a challenge on his sport catamaran without cabin, alone and sailing old school. at the rhythm of a pipe, Bourgnon went in the Normand harbor before spraying the crowd and journalists on site with champagne. It took him over 20 months and thirty stops to win his challenge. Specialist in extreme raids, he thought he wouldn’t finish his world tour when his ship wrecked in August 2014 in Sri Lanka, after traveling almost 80% of the course. But after 2000 hours of work in three different construction sites, financed by a participative campaign, he was able to repair the damages and to face the last 10 000 km of his course. It’s under the sun and with applause from a few hundreds of curious – as many children of the city yelling “Yvan, Yvan” with the rhythm of a pipe – that Yvan Bourgon’s catamaran of 6,20 meters long went into the Normand harbor. He had to wait another hour before being able to see his family. 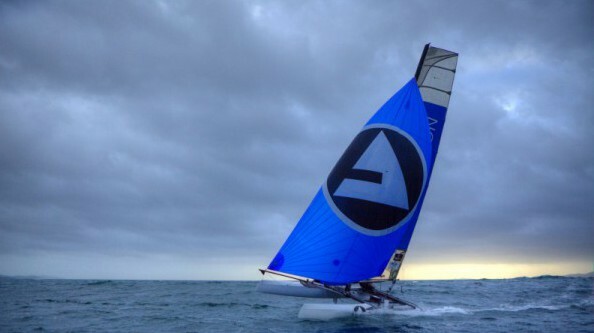 It took twenty three months and thirty stops to the adventurer, gone from the Sables d’Olonne in October 2013, to realize his challenge with a catamaran without electronics. It’s only with the help of a sextant and some paper maps that he had “Louloutte” course over 50 000 km, as he lovingly named his boat. Specialist in extreme raids, he told the story of his adventures on his website, claiming he crossed some pirates close to the Island of Socotra (Yemen) and lacked drinkable water, being close to dehydration. He also thought he wouldn’t be able to end his trip, when he wrecked his boat in August 2014 in Sri Lanka, after about 80% of his course done. But after 2000 hours of work in three different construction sites, financed by a participative campaign, he was able to repair the damages and to face the last 10 000 km of his course. 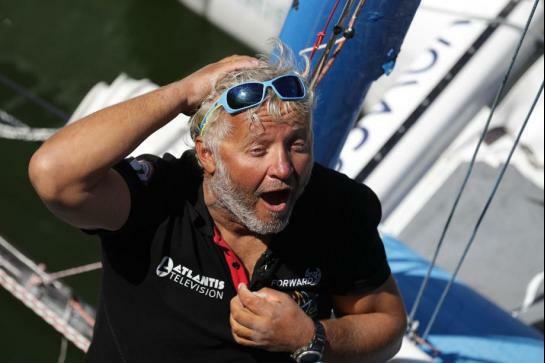 Even his mother thinks he is “crazy’: the Swiss Yvan Bourgnon finished on Tuesday in Ouistreham (Calvados) his world tour in catamaran without cabin, alone and sailing old school… twenty months after his departure from the Sables d’Olonnes (Vendee). He got into the Normand harbor at 10:57am, and it necessitated almost 2, 5 hours to come on earth. Under a beautiful sky, he was welcomed by the cheers of the crowd, including 150 children from the school, yelling “Yvan! Yvan!” at the rhythm of a pipe. After sprayed the journalists and close ones with his magnum of champagne, he hugged his mother, Suzanne, with watery eyes. It’s true that “crazy” is a good word to describe the challenge of sailing with a sextant and paper maps, without any electronic help, on a 6,20 m long catamaran, without cabin, to travel 55 000 km with 20 stops. During 220 days of sailing, Bourgnon knew everything on his “Louloutte”, like he calls her lovingly. “Between Martinique and Sumatra, it was bliss… tradewinds, stable winds, I really enjoyed. I know why I did this world tour, it’s because of these moments”, he remembers with a smile on his lips. ”When my ship wrecks, that it’s dislocated, that I have a hernia, that some sponsors quit, I told myself the adventure was over”, he told. Because of a mobilization effort around his project, the help of the city of Ouistreham and a funding campaign, he managed to pay the 2000 hours of repair in three different construction sites to get back on the sea. Unfortunately for him, the following is not much calmer. “ the hardest part of the challenge was clearly the Red Sea and the Mediterranean sea (…) permanent contrary winds, huge waves, storms and cargos all around, I almost collided with 5”, he detailed. But now that he is on coast, he only wants to keep the positive. “I learned a lot on a medical, physical and mental plan, some amazing things only on our senses”, he told. “When you’re on your boat, and you manage to hear a cargo even before seeing it, you manage to smell earth before seeing it, to feel the wind even before it hits your sails, you achieve a kind of alchemy with your boat that is unimaginable, précised Bourgnon. An almost organic relationship, helped by his choice of navigation, totally against today’s boats with all their electronics. His program for the next few days is simple: meet up with his family, “party” and “share”, with a 90mn documentary that will be broadcasted on Voyages in September. But for the specialist of extreme raids, the want he feels to go away in always there. During his last hours of his course, he already had the temptation to go on another tour. “I can tell you I wanted to put the light on my left, and make a U turn”, he said. But the Swiss already has two new projects: buying maxi-multihulls to make a world tour against the winds alone, and achieve a tour of the Antarctic on his “Louloutte”. Obviously, his mum still has some worry to make. After over than 55 000 km and 20 months at sea, the Swiss navigator ended on Tuesday in Ouistreham his crazy adventure started on October 5th 2013 in Sables d’Olonne : a trip around the world alone on a unlivable sailboat. Some friends and some family. His mother, Suzanne, overwhelmed by emotion tries to find her words. To her, this adventure was kind of a nightmare. « I hoped he wouldn’t do it. It’s hard. He was risking his life. At the beginning he had a following boat in case of a problem. But then, he had nothing ». Gone with him on October 5th, 2013 from the Sables d’Olonne, his partner Vincent Beauvarlet gives up during a stop in the Canary Islands in November. In August 2014, the adventure comes abruptly to a stop in Sri Lanka. « When my ship wrecks, that it’s dislocated, that I have a hernia, that some sponsors quit, I told myself the adventure was over”, told the Swiss navigator. “And then, when you see people behind you, every helper, I told myself I couldn’t stop”. “I thought it was only a formality. And I came to handle the most difficult part of my challenge. The Red Sea and the Mediterranean Sea, with winds against me, huge waves, storms, and cargos all over. I almost hurt five of them ». It’s the end of an extraordinary odyssey for Yvan Bourgnon. Gone since October from the Sables d’Olonne on an unlivable catamaran, the navigator ended on Tuesday in Ouistreham his world tour on a sailboat. A course full with traps… In the end, the Swiss skipper will have traveled 55 000 km alone on the globe’s seas. Yvan Bourgnon is a Swiss skipper, born on July 6th, 1971 at La Chaux-de-Fonds. He is the brother of Laurent Bourgnon, who he won the Transat with in double Jacques Vabre 1997. At 8, he goes on a world trip with his parents that will last short of 4 years. When he is 13, his family settles in Saint-Brevin-Les-Pins, in Loire-Atlantique. He is known in 1995, when he won the three races: Mini-Fastnet-Transgascogne, Mini Transat, and a performance never redone since. In 1997, on Primagaz, he won with his brother Laurent the Transat Jacques Vabre. In September 2010, he beats his first record: crossing the Mediterranean sea with Jérémie Lagarrigue, joining Marseille to Carthage (Tunisia) in 53h52’. In January 2012, along with his partner Sebastion Roubinet, he does the tour of Cape Horn in a Nacra F20 of 6 meters long. In 60 hours and 450 intense miles with 45 knots of wind and 7 meters waves, he achieves his unbelievable challenge. Three months later, in the LinXéa Challenge, he signs the absolute records of the 24 hours sailing alone, traveling 344,5 miles in Brazil. 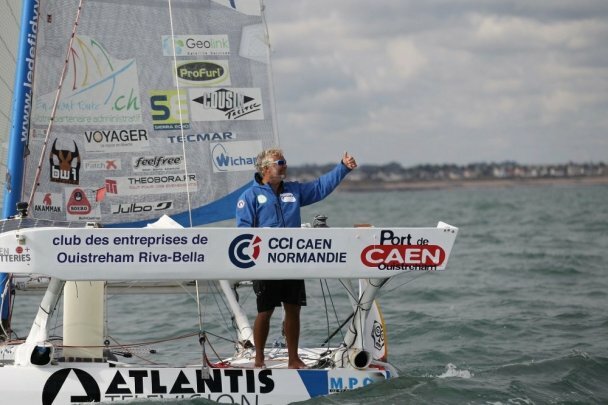 On October 5th of 2013, he departs from Sables d’Olonne along with Vincent Beauvarlet to accomplish a world tour “old school” on a sport catamaran of 6,30 meters, unlivable. The two navigators don’t have assistance, don’t receive any weather information, and don’t have a GPS. They only have a sextant, a satellite telephone and some traditional maps. At Las Palmas de Gran Canaria (Canary Islands), Vincent Beauvarlet gives up. On November 20th, Yvan Bourgnon keeps up alone. 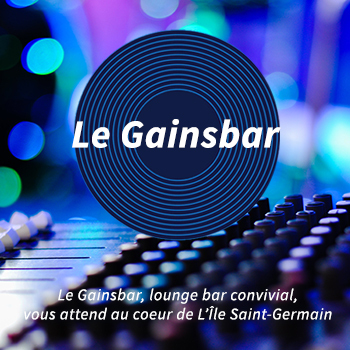 He arrives at Marin, in Martinique on December 10th. He leaves on February 3rd 2014 and gets co Colon in Panama the 9th. After crossing the locks, he leaves the Peals archipelago on February 23rd and arrives in Puerto Baquerizo Moreno, on the Island of San Cristobal (Galapagos) on March 2nd. He leaves on the 7th for his longest trip to the Marquees Islands. He arrives in Nuku Hiva on March 27th. After a stop in Tuamotu, in Tahiti, in Raiatea, in Bora-Bora and in Samoa, he arrives in Viti Levu (the biggest island in Fiji) on May 17th. He stops again on the islands of Vanuatu and in Darwin, in Australia. He arrives in Bali on July 1st. He leaves Bali on July 12th for the Maldives. The conditions at sea have worsen, he changes course to Galle, in Sri Lanka. On August 1st, approaching the harbor, he wrecks the boat. He is unscathed, but his boat is destroyed. The Atlantis Television Challenge is an adventure that immediately seduced the team. After a first experience with his record around Corsica Island, we wished to be there again with Yvan Bourgnon, in the end of this extraordinary human adventure.